I’ve mentioned on the blog before that side dishes, for me, are usually an afterthought. I spend lots of time planning meals and browsing recipes for main dishes. But when it comes to the sides, I just heat up some canned veggies or a pack of Uncle Ben’s rice…anything that’s quick, brainless, and recipe-free. However, there are rare occasions where I’ll actually put some effort into my sides as well. These occasions are typically special ones, like anniversaries or Valentine’s Day or something. Other than these special occasions, here is the key to my “fancy” (meaning something I don’t just heat up, but actually prepare) side dishes…I only make them whenever I have a reeeeeaaally easy entree to pair it with. That way, my thoughts aren’t having to go in more than one direction and I can focus on one thing or the other (i.e., the entree or the side dish). Of course, you may be a super multitasking fool with a 10 burner gas stove and 2 ovens and making so many dishes at once may be a piece of cake to you! Or maybe you have a little helper in the house who can make the side dish while you do the entree. In that case, go for it. I’m just sharing how I do things. And in case you’re wondering, this skillet corn salad did in fact go alongside a really easy entree which I will post tomorrow! 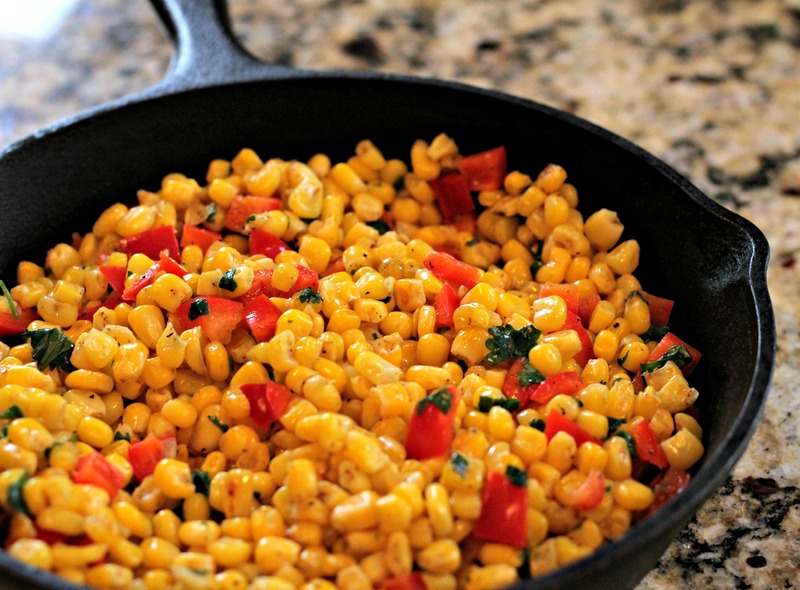 In a large heavy sprayed skillet, sauté corn until lightly browned. Transfer to a large bowl; stir in lime juice. Add remaining ingredients. Serve room temp. I made this tonight to take to a picnic tomorrow. It was super easy. I actually used fresh corn. Lightly boiled it for 5 minutes. Then ran cold water on it to cool quickly. Then I cut kernels off Cobb. Taste wonderful. Used 8 cobbs of corn. Thanks Cindy! This is a perfect picnic side dish!